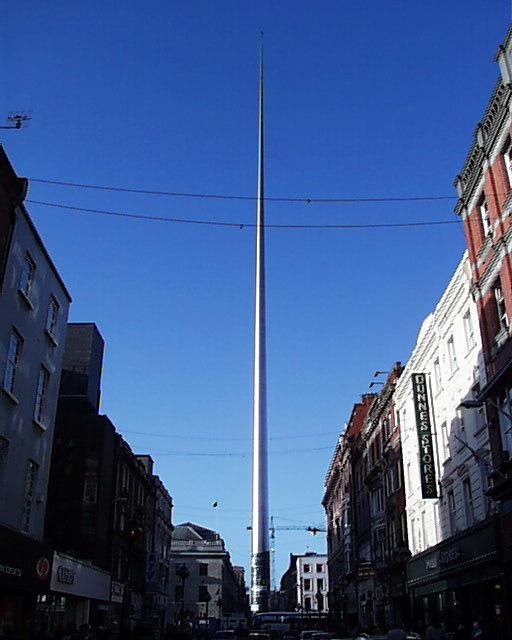 The Dublin Spire was the winning entry in an architectural competition to provide a replacement for Nelson’s Pillar which was blown up in 1966. After a planning appeal and a High Court case, the Spire finally got the go ahead. It was erected between December 2002 and January 2003 to great public excitement. Archiseek has construction photographs. 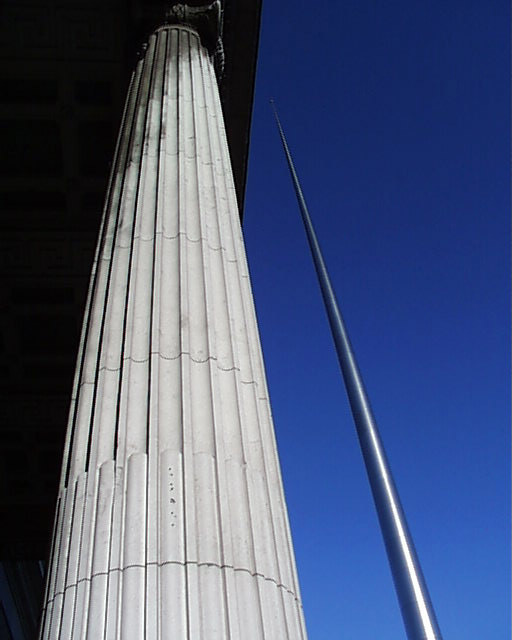 The column to the memory of Nelson, which was one hundred and thirty-four feet high, was erected in 1808, the foundation stone having been laid by the Duke of Richmond, Lord Lieutenant, on the 5th of February in that year. William Wilkins of Norwich designed it, but the statue of Nelson is by an Irish sculptor, Thomas Kirk, R.H.A. Nelson’s Pillar was erected by public subscription and cost £6,856. It was blown up in 1966 in the middle of the night, but the head of Nelson has been preserved by the Dublin Civic Museum. 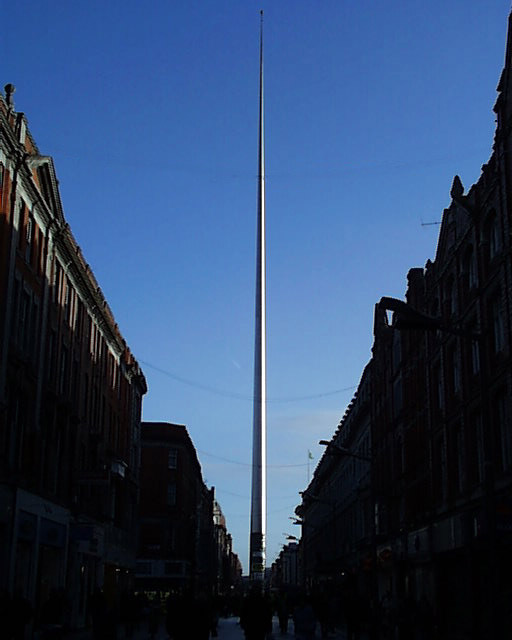 The Dublin Spire is one hundred and twenty metres tall, making it by far the tallest structure in Dublin city centre. It is three metres wide at the base and tapers to a 15 centimentre wide beacon at the top. The top section is perforated and lit by small LEDs. This fabulous structure looks different under every lighting condition. At night, its stainless steel surface resembles black satin, while early morning and last light gave it a steely blue colour. In daytime under bright sunlight, it doesn’t look real from a distance, instead it looks like a computer simulation. 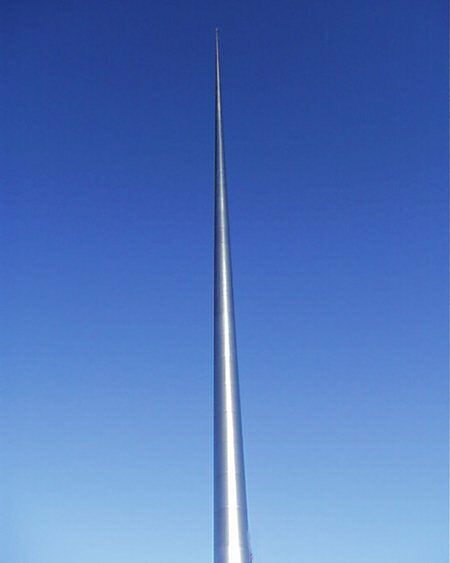 Archiseek followed the erection process of the Dublin Spire with regular photographs. In addition the original information from the announcement of the Spire as the winner of the architectural competition can be read here.